It's been about 10 days since I lasted posted about breaking the 70 day mark. That seems like it was a long time ago, but of course it's only been 10 days. Review course information and register for classes online. Our appearance standards are an important part of our company's heritage. You are expected to review the full Disney Look guidelines prior to arrival. You must be fully compliant with the Disney Look guidelines when you arrive. Incoming participants may have the opportunity to indicate preferences for apartment complex, unit size and/or roommates. Pre-registration begins approximately 10 days prior to check-in day. Your official training and certification will be handled in Florida. Test your Disney Heritage knowledge throughout this interactive game. Use your log-in information and password that you used for this site to launch missiontimekeeper.com. My arrival date is Jan 20th and so far I have registered for classes (I've been wait-listed for Disney Heritage), reviewed the Disney Look (I might need to buy new glasses), have my housing/roommate preferences (found my awesome room mates via Facebook), Prepare for swim test (I don't need a swim test - I CANNOT swim) and Play Mission: Timekeeper ( I have not completed the somewhat boring Mission: Timekeeper game). I might add the Timekeeper game to my Pre-arrival To Do List or bucket list since Disney Heritage is out of the question. I'm convinced it won't open up. Although, I may decline the class, so I can have my other off day and the remaining part of my day on Tuesday after Exploring Guest Services. Oh! Some people have already received their New Hire Documents. They say it's not going by arrival dates, I disagree because . . . only Jan 8th and Jan 13th arrivals have received their paperwork. No other dates have received the new hire documents. Although, there have been some "Dashboard" problems for some Jan 20th arrival participants, I don't know if it means anything or not. They say when your Dashboard goes from "Post Offer Stage" back to "In Progress" your papers could be on the way. Anyway, according to this timeline Disney provided on it's website, everything is in order! Bring on the 2 month wait . . . after Thanksgiving . . . this will be a breeze . . . I hope! What is the Disney Look? The information about the Disney Look is very straight forward on the onboarding website. They will send you emails, put in your contract, pre-arrival information, tell you in the interview about the Disney Look. It should come as no surprise on arrival day . . . right? right? Well . . . . uhmm *clears throat* . . . . There are some things to consider . . . now, I can only talk from a girls point of view (sort of) about the Disney Look. Your Hair Color - you may be asked to dye your hair even if it's natural. But if it doesn't LOOK natural, you may be asked to change it, so be prepared for this arrival day. Your Glasses - you have blue frames, polka dots, green stripes . . . well they may not be apart of the Disney Look. You may asked by Casting/Costuming/Your Leaders to removed them and get NEW ones . . . no joke. This happened to a few alumni and they said to just be prepared. Tattoos - Got a role where you will be washing your hands a lot? Got a wrist or hand tattoo? Well be careful, cause it may wash off (depends on cover up used). Test out some alternatives or water proof products before arrival. Your nails - This is easy . . . keep them short with neutral/natural colors. No bright or neon. Dark and neutral colors. Acrylic are allowed if they meet all of the Disney Look requirements such as length and color. French tips (pink/white or white/clear) are also allowed. Facial Hair - Don't forget this . 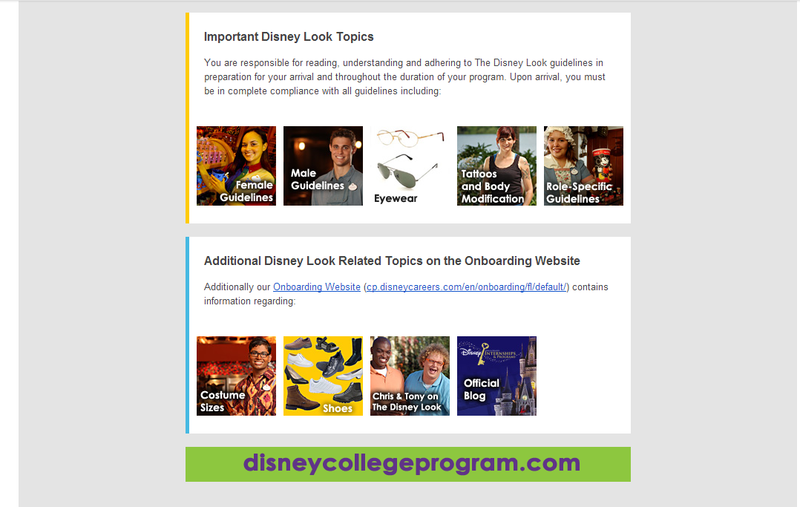 . . read the Disney Look onboarding page BEFORE arrival. Hair Style - People with dreads - please find out what is or isn't acceptable. There is NO clear answer on if they're allowed or what is acceptable. Same with girls with braids - braids too thick (box braids) or too long may not be acceptable . . . just ask!! Shoes - Custodial and QSFB roles will be given shoes. All other roles must find out from their Leader upon arrival. That all I have for this . . . be prepared to change your look and style. You don't want any surprises or rude awakenings come check-in day. You either change it or go home! I wanted to provide a quick example for anyone to use for their room mate survey. The room mate survey gives people general information about you and your lifestyle. You can copy/paste the survey from anyone in your arrival date group or download it here. Please read my word of advice. I am by no means a DCP expert (just an alumni) but I have plenty of common sense. LOL! Please don’t lie!! Be up front and keep it real. It shows maturity when you can be direct and honest about what you want without being disrespectful. If you want to party and drink, please admit it . . . . If you hate drunk people, say so . . . If you all you wanna do is bake brownies and watch Disney movies everyday during you entire program, say it . . . it will save you a HUGE headache later. Besides, you want people that are like or favorable to YOU. Be vigilant in your search for a room mate. That means, post in ALL the groups because some people may not be in the main page or in your arrival page group. Keep posting, some people get accepted really late or wait til the last minute. For example, Chatham residents can visit each other after 1AM (of course you must be considerate of others). Patterson residents can visit each other . . . and so on. However, Chatham CANNOT visit Patterson residents after 1AM. How do you feel about visitors during the day? night? after visiting hours (if in the same complex)? How do you feel about drinking? being buzzed/slightly drunk? drinking games? throwing parties? Would you ride a party bus? go to universal? visit a beach? go shopping? trips to Miami? how late do you stay up? When do you wake up? Lights on or off at night? TV on or off at night? Cold or Hot room? Fan or no fan? Messy or Clean? To me these are the most important questions you should ask your potential roommates after reviewing their survey. Finally to the room mate, you may add more details. . . the more the merrier. Are you allergic/allergies to anything? Are you applying for WDW or DL? Do you want to live in Wellness or Non-Wellness? Do you party? How often? What does your bedroom normally look like? Do you like it when your room is hot or cold? Would you rather go out or stay in? What do you like to do on your days off/the weekend? Are you outgoing or quiet? Do you like hanging out with people or keeping to yourself? What would you want in a roommate? What are your biggest pet peeves/dislikes? Do you like having people over a lot? What is wellness and non-wellness? Straight to the point: Wellness means under 21 and Non-wellness is over 21. You will need to mention this during your DORMS registration. Wellness participants cannot consume alcohol inside the apartment, keep alcohol inside the apartment, or consume alcohol on the apartment complex grounds. You cannot consume alcohol outside of the housing complex (it's against the law, remember! ), on Disney property or anywhere else DURING your program because "it's against the law". If you do, you are at risk for termination from the program, if arrested by officers or turned in to housing/security. Drinking underage outside of Disney property or Disney housing can still get you termed, IF they found out. If you decide to do, so please be careful. If you go out somewhere to party and come back shitfaced housing won't say anything to you. Unless your being a belligerent drunk, violating housing property, and disrespecting security they won't say much when you come back to your apartment. They can find out, IF someone reports it to housing. People can report your activity and behavior to housing. I've been told and read via Facebook: for example, the waitress at the restaurant can report you - remember when you flash your Disney ID for that discount, posting on social media - remember all those friends you added before the program, another CP/ICP - spies/snitches on the party bus, clubs, etc., co-workers - don't talk too loud about your night out . . . these are just a few ways YOUR bizness can get to housing or your managers. If another CP living in Disney Housing (see the complexes) hosts a party with alcohol and YOU are present . . . BE WARNED . . . you face a HIGH risk of termination. Even if you are not drinking OR holding alcohol. The policies on this subject are NOT clear VIA INTERNET. Wait until you have your housing meeting (on day 1 or 2 of arrivals) to find out how they operate. Best Advice: Ask security at any complex to get a clear idea on the policies for underage participants attending a CP hosted house party. Mention that you don't drink. Security usually rotate complexes, so they have a good idea of what goes down. Non-wellness participants can consume or keep alcohol inside the apartment. You can, of course, drink outside of housing, on Disney property, and wherever alcohol is served. Hosting Parties: Serving drinks to minors, of course, is against the law and against your Disney contract. This can get you termed. So if you're hosting a party in your apartment, make sure to ask for their HOUSING ID, and NOT their STATE ID because those can be fake (real talk). As for the Party Bus situation, their is NO clear answer VIA INTERNET on this subject. Housing is against them of course . . . . I discuss this fully in this post. The problem is a person over 21 can be termed for under 21 individuals drinking on the party buses. I know this seems crazy. However, new alumni (2012-2013 participants) say that it HAS happened and it IS possible. It will be has discussed in my Grey Topics post coming up soon. 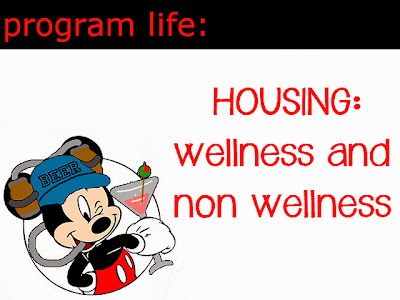 Non-wellness are allowed to room with Wellness participants, but a Non-wellness participant must sign additional papers stating they will not bring alcohol to the apartment and follow the rules like any other Wellness participant. Obviously, wellness cannot room with Non-wellness roommates. Unless, ALL your future Non-wellness room mates sign the paper work. You must consider this when choosing room mates. This is the biggest decision is for a Non-wellness participants, who want to room in a Wellness apartment. Many alumni agreed that it's better to just live in a Non-wellness apartment if you're over 21. Think about this: You cannot even bring home purchased wines, liquors or champagnes from EPCOT to mail home to friends or family. Nothing you buy can be brought home. Unless, you really just do NOT drink alcohol, I would advise no Over 21 participants to stay in a wellness apartment. Many will not even take the risk. But, of course, this is a personal choice. On November 15th, 2014, the Disney College Program application season has officially ended. No more applications can be submited and anyone waiting to hear back from Disney should have received an answer from recruiting regarding their application status. The ability to actually submit an application ended on October 31st, 2014. However, for individuals who did not receive a Web Based Interview (WBI), were pended, completed restricted hire papers, and did additional background checks will receive a final answer on or before November 15th, 2014. Although, there is strong possibility individuals could be contacted after this date to participate in the program. 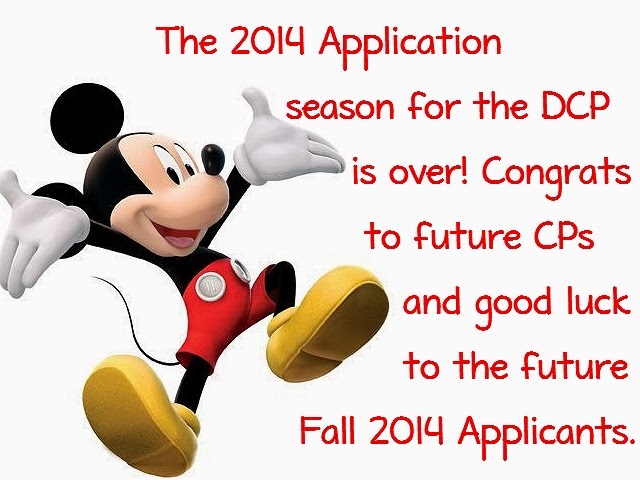 There have been stories of some applicants receiving an acceptances from Disney Recruiting in December! Rumors of applicants who have been NLIC'd (No Longer In Consideration), have been contacted in the past to participate in the program. The possibilities are endless when it comes to the DCP Recruiting team. To those NLIC'd, please keep your head up . . . your time is coming soon. There maybe bigger and better things waiting for you. Patience is a virtue. The Fall 2014 Facebook page has been created . . . join it now! 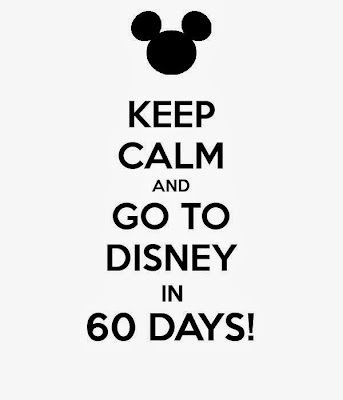 I can't wait to see everyone in Florida!!! 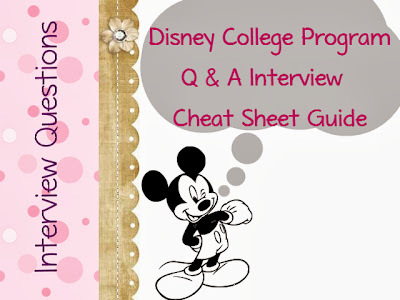 Here is my Disney College Program Interview Cheat sheet. I was asked about 90% of the questions on this sheet except for the Merchandise questions. So, this was a solid interview cheat sheet for me. I put this in a Word document, edited it to fit my needs, and printed the sheet out on the day of my Interview. The "Tips for Interview" part was for me personally. LOL! Most of these were my personal thoughts and answers. Majority of it came out very different that what I typed. My interviewer was extremely nice and bubbly. The interview was 20 minutes long and she called 5 minutes before my schedule time. She spoke really fast, but at the same time, I didn't feel rushed. Many people ask, "When do I request a location?". Well, at the end of every interview, the recruiter asks, "Do you have any questions for me?". That is YOUR moment!!!!! I don't know why there is so much confusion about when to ask! LOL! Why do you want to do the Walt Disney World College Program? No one can really answer this for you. Even though, I typed up the somewhat generic answer below to help arrange my thought, I ended up speaking from the heart. My answer came out 10 times better, than what's on this cheat sheet because I was honest and really wanted my recruiter to know how I truly feel about the program. My recruiter ended up loving my honest and heartfelt answer!! 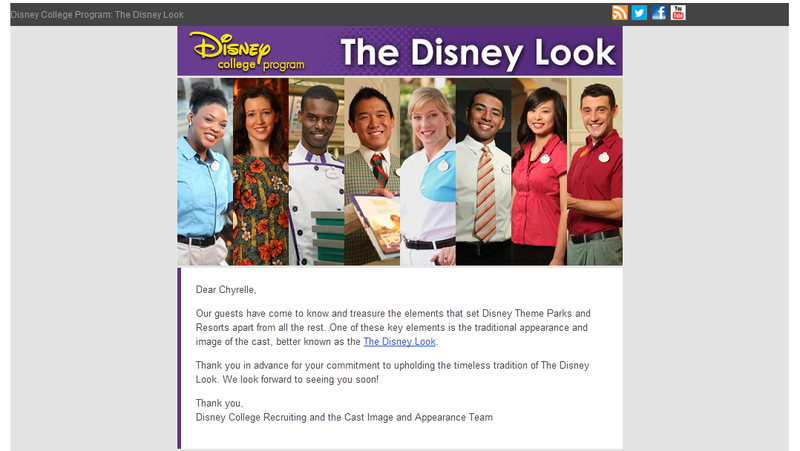 My Generic Answer: Ever since I completed my last program, Disney has remained strong on my resume and I have been offered many opportunities because of the DCP. Being a part of the DCP, taught me independence and responsibility. I want truly want to experience this amazing opportunity again. I enjoyed meeting new people and improving my work skills, so to sum it up . . . I honestly miss Disney! I looking forward to the opportunity to create memorable experiences for guest and working with cast members from all over the world. Living in Florida, the warm weather, and roommates. When I hear the word Disney I think of magic, family and happily ever after. To me Disney means making guests dreams come true. I can offer a positive attitude, hard-work and honesty. I can help keep the magic going throughout the parks and resorts. Be professional and a team player towards my fellow cast members. What would you look for in a CP applicant? Good candidate for the Program? A good CP would be an individual who is responsible, has a strong work ethic and can maintain professionalism while working well with others. How will the college program help you professionally? The college program will help me ___________________________________________. Mention your future plans, skills you will gain, connections that will be made, etc. Are you willing to maintain the Disney look? Have you ever been to Disney World/Disneyland? Did you like it and why? Do you mind working outside in the Florida heat or inside in cold air conditioning? Would you rather work independently or in a group setting? A slow or fast-paced environment? I wouldn’t mind either situation because I consider myself a diverse individual and I adapt well to any situation. In emergency, I would stay calm, abscess the situations and look for potential dangers and evacuate guest to a safe place. I would then get further instructions from my coordinators and/or managers. How would you handle a guest who doesn’t speak English but clearly needs help? If a guest did not speak English, I would ask another cast member or direct to guest services (if available or close by) to translate . If no one speaks the language (this has happened to me at All Star) then I would use pictures or items to describe what they wanted or needed. Do you mind working mornings, evenings, late nights, weekends, and holidays? How would your coworkers describe you in 3 words? My co-workers would describe me as ________________________________. How would you interact with guest? Make a guest’s day? To interact with guest, I would address children as princess, pirates, and cowboys’ or address them by the theme of my location or attraction. I would also speak with anyone who has a pin for example “Happy Birthday!”, or “what are you celebrating?” or “how is your first day in the park?” I would also do water mickeys if in custodial, pin trading for merchandise, suggest magical poses in character attendant, stickers in attractions. I would also do hula hoop, trivia, balloons, games, and other activities based on my role and location. What are your top 3 to 5 roles? What are your past job experiences and how do they relate to the roles you chose? If you're asked this question, list each role, the experience, and the reasons you chose this role. Even after answering this question, you may be asked more questions "AGAIN" about each role. I understand what it means to keep character integrity and create magic. I have no problem answering questions all day. I would love sharing information about the parks and the best times to meet characters. How is _____________ in two parks at once? They use tinker bells pixie dust to move between parks. They must save their voice for the show!! What would you do if a child being rough with the character? What does character integrity mean to you? Character integrity means preserving the magic. There is only one Mickey Mouse, saying things such as he doesn't go to the bathroom, but he is going to get have lunch with Minnie or Buzz needs some batteries. Also, when outside of work or off the clock it’s important to say you’re friends with “Mulan” or “Goofy”. Be creative with this answer. Mention characters and something funny. What would you tell guests if you had to turn them away because a line was closed for the day? I would apologize and give them the next time and location that this particular character will be available and also inform them of any characters in the park at this very moment and the location of these characters. I would also recommend some good times to see their favorite character. How do you feel speaking in front of large groups? Use school presentations for projects,any church or club functions, drama clubs or classes, public speaking classes . . . use anything. What would you do if a 4 year old girl wanted to ride Space Mountain but she was too short? If a child is too short to ride, I would apologize and tell them they are a little too short to ride this ride but I can show them some awesome rides in the park that are just as cool. I would then ask the parents for their map and then mark or show them all the attractions the child can get on. I would then give the children stickers or something cool to make them feel better and encourage them to return when their taller. If you were doing a task that was repetitive (spiels), how would you keep yourself interested in it? I would find ways to get guest excited. I would say my spiels in as many exciting voices or tones as I can. I would find little games like “who can be the loudest” or “who can find a hidden mickey”. I would move around a little bit or wave to guest about to take off on a ride. If a package of chips comes at $1.50 each, and a guest wants 3, and gives you $10, how much change do you give back? What would you do if someone wanted an item, and the shop was out of it? I would apologize for not having the items in stock. I would call down to the stockroom and ask them if the items are available . . . if so I would have them send it up. If it’s not available, I can tell them where to find it or possibly have it ordered to their room or reserved. But an effort will definitely made to find their requested item. What would you do if a guest wanted a specific item that you did not carry anywhere in your park? I would tell them what park has the items or refer them to Downtown Disney ‘s, World of Disney store, since they have many of the same items and it’s on of the biggest Disney merchandise stores. Also, ask check if it’s online. Maybe offer to reserve or order the item. You will have to be able to pin trade with customers, will you be comfortable with children touching your lanyard and asking to trade? Yes. I want the guest to have the most memorable experiences. If your phone is ringing, you are checking a person out, and someone in the store needs help with an item… what do you do first, second, and last? Answer the phone and ask them to hold, apologize to checkout customer and then answers the customer question. Have you ever had experience cleaning? Are you allergic to any chemicals, cleaning supplies, or latex? Can you handle talking to multiple people and multi-tasking? Can you handle working outside for up to 8 hours a day? Yes, can I request a park location at this time. Have you done the DCP before? How did you like it? Where did you work? Tell me about your Disney Career? Do you have any magical moments or experiences? How do non-credit classes work with the DCP? The most classes? How does it work with my work schedule? Recommended? Did you take any Disney Classes? What kind of qualities does Disney look for in future CPs? Can you explain the Disney Look? Glasses black frame fine as well as transition lenses? When will I hear back about if I am accepted or not? Tell me about a time you were a team player? Name a time when you went out of you're way for a guest or made guest feel special? Tell me about a time when you had to deal with a difficult guest, co-worker or manager? Name something you didn't like about your past jobs? For example, my interviewer noticed on my application, I went to China. She asked me, “While you were in China, how did you communicate with people?”. Instead of asking me, “How would you handle a guest that couldn't speak English?”. My interviewer even asked me some questions twice but worded differently. Also, I may have answered a question early on in the interview, but the Interviewer will ask the questions anyway. For example, when she asked me to list my top 3 roles and why I chose those roles, I mention Character Attendant and said I talked about my knowledge of Character Integrity. Later on, while asking role specific questions, for Character Attendant, she asked me, “What does Character Integrity mean to you?”. This happened more than once during my interview.